Join Morgan Stark from Green Witch Healing Arts to learn all about fairies and the magic of spring! We will discuss what fairies are and what their purpose is. We will learn how to see them, how to keep them happy and work with them in your life. Morgan will talk about the powerful magic spring brings and teach us some simple spells. Together we will build a fairy house in nature with magical intention. We will also make a fairy wand for you to take home and Morgan will teach you how to use it. This class is family friendly and open to all ages. Much of the magic of fairies is letting the inner child come out to play. Morgan will share some thoughts and tips on how to come back to the essence of your inner child. Will you be needing the sliding scale option? This gathering is full. If an opening becomes available this will be posted on our instagram and FB pages. Thank you!! Join Ilana Sobo, founder and creator of Shakti Botanica for an incredible and indepth course on how to grow a home herbal garden succesfully. Ilana is a fascinating and incredible teacher. She offers so much information and clarity to her community on working with herbs and a multitude of herbal methods for complimentary wellness. 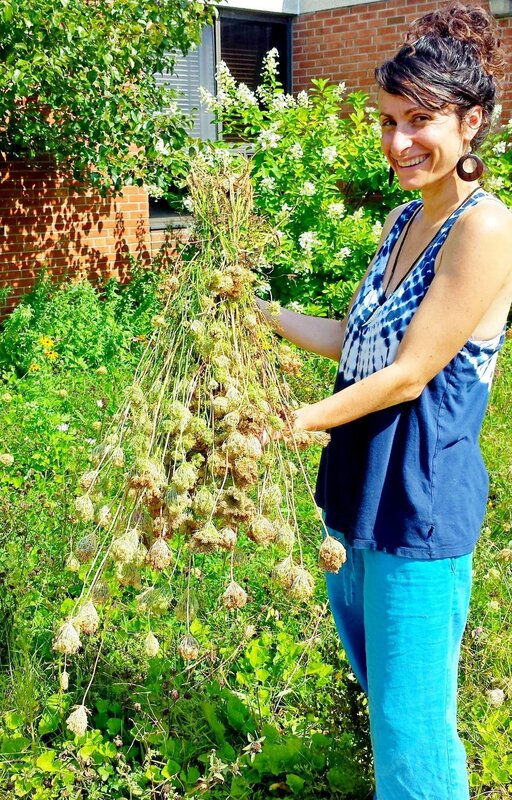 Ilana is a returning instructor to Mountain Hollow Medicinals and we are grateful for her presence here in our community as she offers an immense amount of knowledge on safety, ethical and proper use of medicinal plants. This introductory and fun filled class delves into the joys of creating a home medicinal garden that is functional, beautiful, easy to grow and that supports optimal wellness for yourself and your loved ones. We will focus on growing herbs for vitality, immune health, managing stress, healthy sleep, optimal digestion, children's wellness and family first aid. We will share about the culinary delights of incorporating herbs into our daily meals and the unique gifts of aromatic plants in particular. We will also highlight basic growing guidelines, companion plants as well as wild plants and wildflowers that can invigorate your home ecosystem. We will close by talking about pollinator friendly plants and how growing for the winged ones creates vital habitat and robust gardens for years to come. Before the end of the class we will walk (less than a 5 minute walk) up to Stillmeadows Gardens and will have an opportunity to purchase and take home an herbal plant to add to your garden. This class is part one to a second class on harvesting our herbs and making folk medicines from them for self and family happening in August. Time and date to be determined. Ilana Sobo is a community herbalist, Ayurvedic practitioner and aromatherapist focusing on the joy and healing power of bringing medicinal plants into our daily life. ﻿A full day retreat of deep inner medicine at Whetstone Wellness in Craftsbury, Vermont with Diana Hansen and Tina Ghantous. Experience the expansion of your intuition as we practice powerful healing tools to dispel anxiety and offer empowerment. Experience yogic practices designed to optimize the flow of prana, or vital energy. Gain a deeper understanding of subtle body anatomy and how it operates in relationship to the elements, and tools to support and strengthen the channels where prana circulates in body and mind. Dive deep into physical, mental, and spiritual relaxation with a tibetan sound bowl bath, a guided meditation meant to release inharmonious energies bringing you back to a higher frequency. Unlock your intuition through a shamanic journey meant to connect you to your highest essence. Create your own Medicine Bag infused with the clarified intentions you bring through the experience, a meaningful and personal reminder of your inner medicine to keep. Crystals and jewelry tools will be provided under the guidance of Diana Hansen. A nutritious, lovingly prepared, prana filled mid day meal will be provided. Join Rebecca Beidler of Walk in Awe, for a slow meander among the trees, getting to know the land at Mountain Hollow Medicinals. In the tradition of Shinrin Yoku or Forest Bathing, we will use all of our senses to experience the land through a series of invitations. 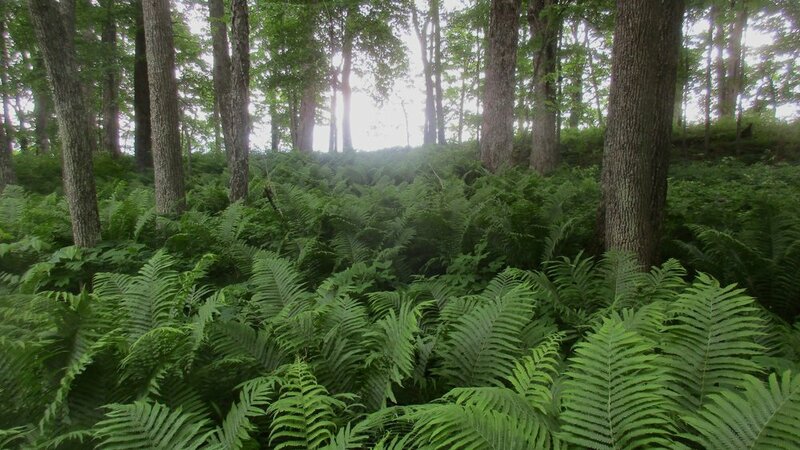 We will walk quietly, focusing on the sights, smells, sounds, textures, and feelings of the forest, pausing periodically to share our insights with the group. We will end the walk by sharing a cup of tea made with plants from the place we have walked. In the past several decades there have been many scientific studies that are demonstrating the mechanisms behind the healing effects of simply being in wild and natural areas. (some of this research is available here). For example, many trees give off organic compounds that support our “NK” (natural killer) cells that are part of our immune system's way of fighting cancer. 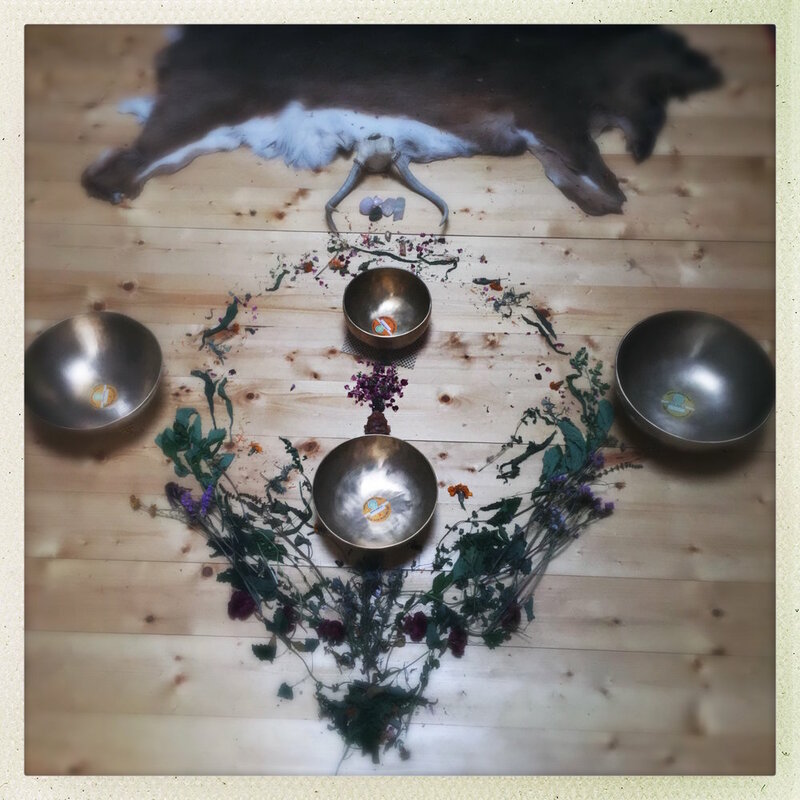 Followed by our forest bath we will conclude our gathering with a guided sound bath meditation offered by Diana, using her tibetan sound bowls. Weather permitting Diana will offer the sound bath in the forest or in the yurt. This will be a deeply healing experience and I hope you can join us. Circle up with with Braelyn Gillespie from Bee Love Herbals and enjoy the simple but profound ancient healing art of self-massage. We will anoint our whole bodies with nourishing, plant-infused oils from Bee Love Herbals. The benefits of body oiling are immediate: calm mind, radiant skin, improved circulation and the benefits of lymph massage. After learning how to saturate yourself with this plant based practice and self love, you’ll want to make this part of your daily practice. It feels wonderful, and gives a sense of feeling nourished and grounded. During the circle, we will remain clothed and massage only ourselves. Please bring a towel and a pair of socks. Dress in loose clothing (a tank top/sports bra and shorts/underwear are recommended but not required)-- whatever feels comfortable! Hot herbal tea and healthy treats will be served. Join Sherri Glebus, master tarot reader, mystic and mountain medicine woman for an intensive on deepening your Tarot practice. Sherri has been a professional intuitive reader/counselor and teacher of Tarot, Goddess spirituality, astrology and spirituality for nearly 20 years and has obtained a Master's degree in Divine Feminine spirituality From Union Institute & University. Together we will dive into the infinite psycho-spiritual power of the Major Arcana. Go beyond card meanings into mythology, Goddesses, the spiritual goals and the astrological associations of each card, paired with succinct readings for self-insight and guidance. Apply these learnings to your astrological birth chart or sign. Tarot is both a divination tool and a wisdom system in use since at least the middle ages. Using the Tarot for ourselves gives us special access to the mysterious realms of the subconscious/Higher Wisdom and even communication with our spirit guides. Tarot is extremely helpful for making decisions and finding the best ways to handle challenging situations. In her years of using Tarot to assist people on the professional level, Sherri has witnessed Tarot leading to beneficial transformation, healing and empowerment. Tarot is a gateway to deep spirituality, and astrology is a gateway to deep self-insight. This workshop will bring all of these benefits into sharp focus as practice so that you can continue using this magical tool on your own with greater skill and knowledge. Please bring your own tarot cards, journal and time and place of birth. Cost: $50 with a sliding scale of $30 - $50. Space is limited so please register and prepay to hold your spot. Please do not forget to prepay to hold your spot. Join us for a workshop on Fungal Pharmacology with Jesse Marksohn from Fungal Forest Farm. The world of fungal medicine is vast. We will begin with a story of medicine and the life cycle of the fungus it was derived from. We will discuss some more general fungal ecology and relevant evolutionary events and talk about fungal medicines that are currently accepted in the west and their significance. Jesse will explain the ecological reasoning behind why fungi have such profound and broad scale functions in medicine. There is a lot of skepticism in this field but this core understanding us to the question, “if our culture is willing to believe in the legitimacy of our anabiotic‘s and ability to perform organ transplants or treat cholesterol imbalance then why would it be a stretch to believe in the medicine contained in all the fungi all around us?” Knowing the ecological reasoning behind these significant effects allows for a much more intuitive lens of where and why these medicines exists. Many herbal medicines are attributed to the plant they were extracted from, however many of these medicines have been found to be attributed to the endophitic fungi living within the hosts tissure. We will then transition into medicinal mushrooms being used in asias pharmaceutical industry and in TCM. Jesse will talk about species with limited clinical trials where more research is necessary such as lions mane and cognition, then talk about identification and collection of a few notable species in our ecosystems and simple to complex methods of preparation. Join Diana in a guided workshop on making your own Medicine Bag. Covering everything from the basic history of medicine bags, the intuitive process while making them, adorning and placing sacred objects within the bag and the healing properties that reveal themselves. We will sew the bags together while tuning in to our intentions in finding support from your new medicine bag. This workshop generally lasts two to three hours and cost is $40 per person which includes one 2x4 size deer hide medicine bag, crystals, dried herbs and feathers from Diana’s personal collection. Other medicine bag size options are available as well as ordering more than one bag per person, please inquire if interested in alternative options. Bring your sentimental stones or objects that you may want to add to the bag. This is an enlightening and empowering workshop that is meant to lift your spirits up and leave with a tool to carry you forward on your journey. 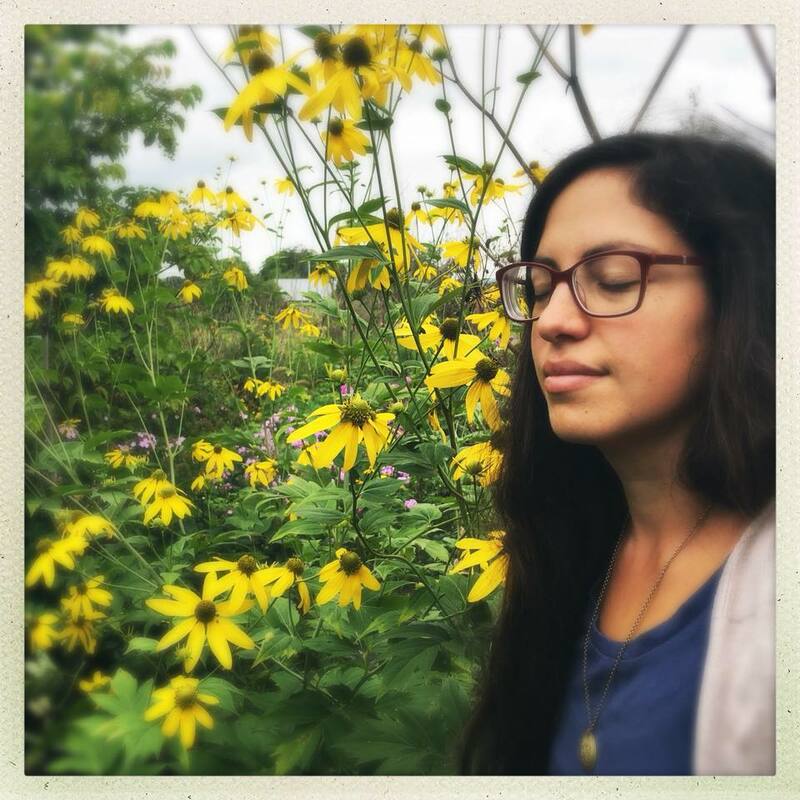 Join us for an evening of medicine and plant magic in the Northeast Queendom led by Marielle Fisher, local herbalist, plant medicine person, and biofield tuner at Whetstone Wellness. Cost $20 - sliding scale available. Olga is a licensed acupuncturist and herbalist at Earth Mama. She has been working in healthcare for almost 20 years and as an advocate for self-determination in health care. As a Cannabis advocate, Olga hopes to increase access for those that cannot afford medical cannabis or who do not qualify based on allowable diagnosis. It is her belief that recreational is medicinal and hopes to broaden conversations & expand the desire for greater liberty in accessing cannabis. Olga is a proponent of more direct participation in shaping the way local governments look to tax and regulate the plant they have historically profited from criminalizing. With hands on clinical experience she is a witness to the incredible potential and applicability of cannabis and her greatest hope that is that more people grow their own medicine! Once all info is complete for this workshop, registration will open. Suggested donation $30 per person - Dreamwork & Visions Booklet included in cost.